Farming offers an opportunity for us to have a balance between our land, livestock and wildlife. We’re blessed to use the land in our possession for a brief amount of time. Our family appreciates the opportunity to care for this land and our animals, and we’d like the next generations to have the same opportunity. By taking care of our environment, we improve the chances of agriculture continuing in our beautiful country. One of the ways we’re working to preserve our land is by working with governmental agencies. Programs like the Natural Resources Conservation Service (NRCS) Environmental Quality Incentives Program (EQIP) help farmers like us conserve our water and land resources. 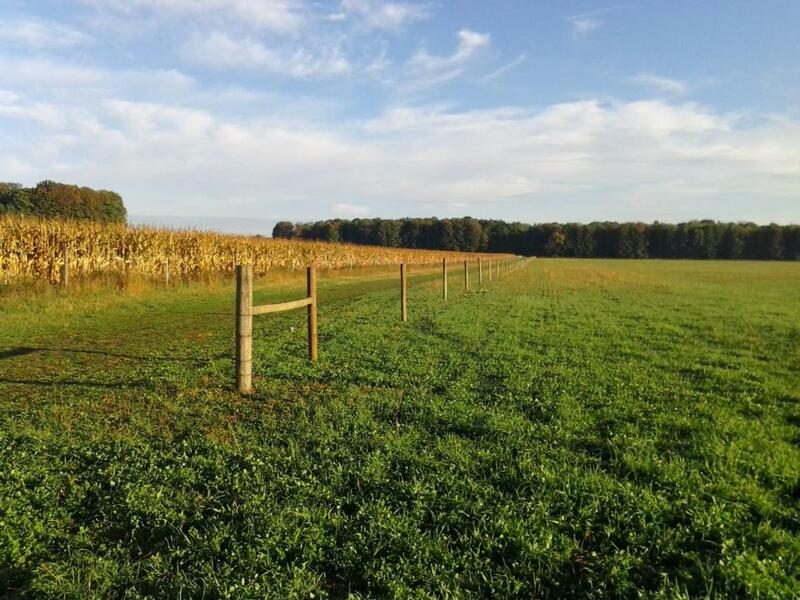 Use cross-fencing for controlled grazing. If we do not make smaller fields, our animals wander and create paths, compacting and degrading the land. We use a pasture rotation system, which maintains forage and animal health. This also limits animal access to water, ensuring our community has fresh water for our family and yours. Use frost seeding to establish healthy forage early in the growing season. Our family worked with Michigan State University to complete forage trials, testing the best vegetation for our northern location and for the health of our land and livestock. From the trial results, we were able to focus our energy on the growth of Italian ryegrass and Alice white clover, diversifying the natural legume and grass vegetation in our area. Use the water resources on our land to maximize our farm efficiency. It is important for us to bring water to our animals 12 months of the year. We have established a watering system throughout our farm to be accessible to our sheep, reducing the time and energy they need to spend seeking resources. Visit our YouTube channel to learn more about our environmental commitment.